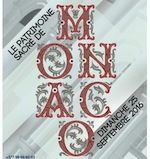 On 24 and 25 September, this year's Journee du Patrimoine de Monaco takes as its theme the Patrimoine Sacré de Monaco. The program can be downloaded on the event website at: Journee du Patrimoine de Monaco. As in previous years, the event begins on Saturday with trips outside Monaco to the San Giorgio and Sant'Antonio churches in Dolceacqua, and the Chapelle Saint Martin in Saint Martin de Peille. Sunday is the main day, when administrative buildings, museums and places of interest are open to the public. Buses are free all day. Visitors should not enter the churches during religious services. Check the program for details. Organized by the Direction des Affaires Culturelles. Note that Monaco may mark the occasion on a different date to France.